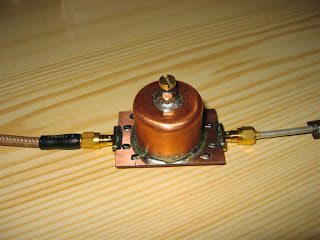 I needed a filter for my 13cm transverter project. What was the best buy option? 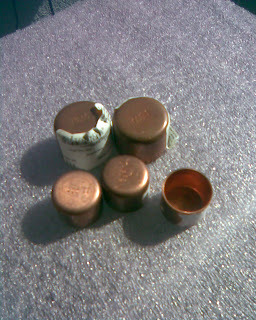 Thinking and looking for the simple filter but with the characteristics that suits my needs, the answer was Pipe-cap. Simple enough, cheap, and easy to tune. After all, so many articles written about it (WA5VJB, W1GHZ, etc.) showing that this can actually work not losing so many time on mechanical design. Check the local plumbing store for the pipe-caps used in the central heating plant. It should look like the ones on the photo. The one we need for the 13cm filter is 1" pipe-cap. Remember that the inner dia. is approx. 28-29 mm and the inner height is approx. 23-24 mm. After choosing the right pipe-cap, a M5 brass screw with two brass nuts should be purchased as well. Beside this we need a two SMA connectors and a piece of double sided FR-4 laminate, 0.8mm will be fine. Drill the 5mm hole in the center of the pipe-cap and solder the brass nut on top of it. Prepare the peace of FR-4 laminate where you etch the 50 ohms micro-strip lines where SMA connectors and probes should be soldered. The length of the probe is 10mm (length inside the pipe-cap) and the probe spacing is 18mm. For the probe use the wire (silvered center conductor rigid coaxial cable should work) or any coper 0.6-0.8mm dia. wire. Don't forget to solder the SMA ground to the PCB. Soldering 1" cooper pipe-cap might be tricky if using just the low power soldering tool. To avoid bad connections use the clothes iron to heat the pipe cap and then even with the low power solder you should not have a problem to solder properly cooper or brass. When finished, the pipe-cap filter should look like this. Tuning the filter to the required frequency can be done with simple RF signal generator and a power meter. 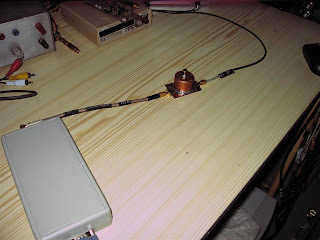 For this purpose I used the 13cm Comtech ATV transmitter controlled with the I2C protocol and a simple diode power meter made from SAT TV LNB mixer diode. Tune the generator to 2320 MHz. Ensure that the power meter sensitivity is set to range 10-30 mW center scale. The screw should be all the way down touching the bottom of the filter. Back the tuning screw out and after 4 to 5 turns you will notice the signal on the power meter. Gently tune to the maximum and that's it. This is the best what you can do just with this type of "tuning set". Use the second nut to stop the tuning screw. After all, a drop of the paint or nail varnish can help to fix the screw and the nuts. If you can read the power, measure the power with and without the filter, the difference will give you a pretty good idea about the I.L. Changing the frequency and measuring the power with the help of the Excel spreadsheet and plotting the chart can give you an idea about the filter pass-band. If you have the access to the network analyzer more accurate tuning and readings can be done. The one I made showing the filter characteristics based on the tune to the maximum method. The filter response is as expected with I.L. down to -2.85 dB and the stop band rejection down to -32 dB for 144 Mhz from the center frequency, not bad at all for such a simple filter. Playing with the size of the probes can give us more or less sharp skirts, higher or lower I.L., all affecting the stop band rejection. * Tuning the filter with the screw is quite sensitive. Trying to stop the screw with the second brass nut may become tricky and not easy for everybody. Try to replace stop brass nut with the nylon one what will produce some tension to the tuning screw and prevent detuning due vibrations. * Instead of using the micro-strip PCB lines, semi rigid coaxial cable can be used as well, extending the center conductor inside the pipe-cap and soldering the coaxial shield to the filter grounding. * The same filter has been used in the home brew 2320/432 MHz transverter with very good results. I have seen some hams use springs instead of stop nuts. I plan to try that.